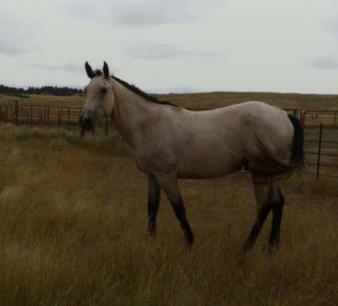 We found an ad on Craigslist for this Beautiful Buckskin named Buckshot...and, since our equine are getting older, it is about time for us to buy younger horses (donkeys too, but not this day) Yes, we did buy him. He has nice ground manners, but needs a bit more work before really riding him, or trimming his feet. We hope to have this all worked out and more before too long. d'Antagnan. d'Antagnan IS a musketeer Name. But did you know that d'Artagnan was a real person? He was a famous Captain of the Musketeers under Louis the 14th? And if you watch the most resent version of the show....d'Artagnan is "ease on the eyes" too....just like this Lovely, Lovely Buckskin! 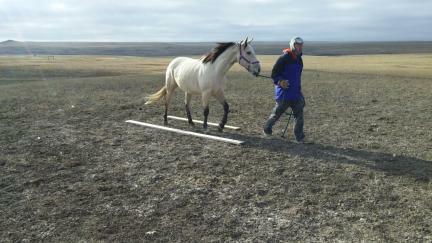 We plan for this page to show not only d'Artagnan's training, but ideas for training your own horses. Mostly Ground Work. We will add what is called Horse Agility, but again, for what they call Horse Agility,(we have a Horse Agility page on this site) I would also/mostly call that Ground Work. But good training all the same. d'Artagnan photos and videos will be on several of this sites pages, not just this one. 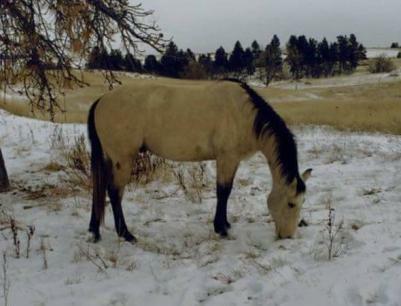 This photo is the first one we took of our new Buckskin when we got him unloaded out of the Horse Trailer and walked over to the Pen he will be in for 30 days...to settle in. Our animals always come in to see us when we get home, and we were afraid we would not beat the goats to the gate walking our NEW Horse Calmly...as you can see, we beat them, but not by much. 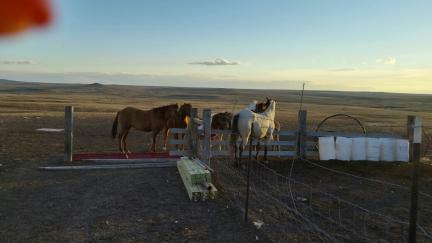 We had no idea how d'Artagnan would act around all the different animals here, he never flinched. He just watched them all, then lost interest. This photo was taken not long after the photo with the goats. We were thrilled it went very well...that Boss Mare is having problems with it, but the rest, all seem to have "a new friend". 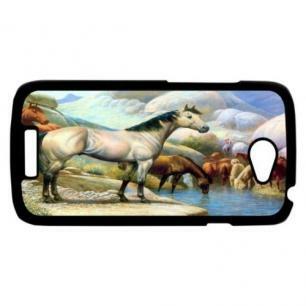 I had been looking, for quite sometime at Horse Print Phone Cases for my Cell Phone...and the night we put a deposit down on d'Artagnan, after we got home, I found this one on ebay...Yes. I bought it. 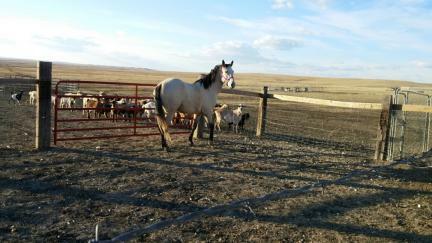 I DO think it looks an awful lot like our Buckskin. Scroll back up a bit and look at d'Artagnan in the photo with the goats, then look at the next photo down of him standing with our other equine. Then look at this phone photo again. To me? Uncanny. But before that, earlier, after looking at the horse for the first time... I literally Laughed Out Loud when....Deron and I had talked about buying the horse, after seeing him, we had stayed in town, for a couple hours talking about it, thinking about it. I texted the owner back and went into a local Farm Store Here. 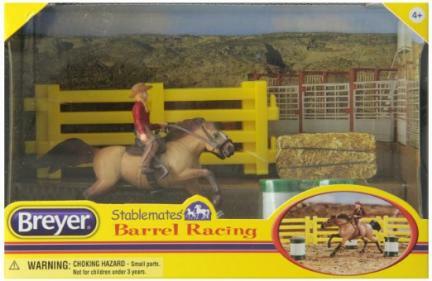 I collect (some/few) Breyers Horses and when I walked into the isle that this store has them in, to see if they added more for Christmas....they had. EACH OF THE THREE SETS ADDED, BUCKSKINS! I bought the one in the photo, just for the fun of it! We are thrilled that this horse has come to live with us and training began today (11-07-2015) Nothing too much. 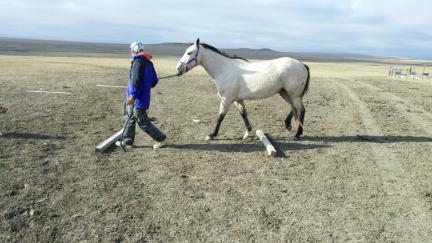 Just worked on loading into the Horse Trailer, it went well, and Deron Groomed and Lifted Feet. There was also a lot of "feet moving" going on between and all went very well. 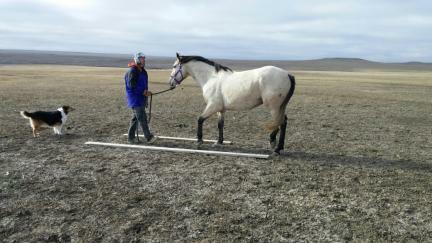 I also want to add, d'Artagnan is a pretty easy horse to catch already. We have been working d'Artagnan every day since we brought him home. He has been doing SO well that we would love to push it up a notch, but since the horse has not been here a week yet....we know better. Every day we work on Loading Into The Trailer. He has never been awful about that, it is just time, and we plan for him to just load up when we ask him to. He still hesitates at the door. But once in, not a problem. Deron can back him out or ask him to turn around and walk him out. Deron also lifts his front feet each day. One then the other, then the other. Yesterday he started back feet. d'Artagnan was funny about his front right the first time asked. But after Deron went all the way around, asking for each foot, and rubbed on the horse, he lifted the back right just fine the second time. Little by little. Little by little. I still believe that lots of grooming really builds a human/horse relationship and we have been doing a lot of that too. 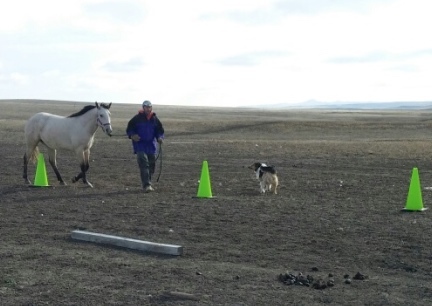 We also, yesterday, on 11-10-2015, took d'Artagnan out to the area I have my Horse Agility items set up and took him around for beginner training. He did WONDERFUL. We did get a few photos. Notice Deron took d'Tangnan forward and backwards inside the boards on the ground. It went great. d'Artagnan has settled in well. None of our animals seem to faze him. We were a bit worried with the overload of different types of species. Our loose chickens, geese and ducks go into his pen and eat with him. The contents of this page for d'Artagnan 2015 is still under construction. Please check back later.